Our Work - Chicago's Premier All-Psychotherapist Improv Troupe !Winners of the 2015 Chicago Collider Improv Competition! We bring Knowledge and Team Work to Your Show! Contact us to inquire about a show for your mental health organization. At present there is a small but growing database of clinicians and researchers looking at how the tenets of improvisational theater (theater that is without script) have a clear and abiding connection to the therapeutic process of "coming into being" ( Gale, J. (2004). Experiencing relational thinking. Context, 75. 10-12). Researchers at the Cognitive Neurology and Alzheimer's Disease Center of Northwestern University's Feinberg School of Medicine, in collaboration with Chicago's Lookingglass Theater Company, examined the impact of Improvisational therapy on Alzheimers in an 8 week study. The results were significant enough for the main researchers to begin writing a curriculum manual so that the improv program can be replicated across the country (July 2011, Chicago Tribune Laughter is the Test Medicine ). The subjects of their study reported "feeling more confident and able to cope with their diagnoses, as well as less isolated and depressed". The cognitive reserve theory for creating a resilience against this challenging disease is shown to be stimulated by the kinds of cognitive challenges and social engagements brought together through improvisation. We also know, without much need for academic analysis, that laughter and connection are essential to what it is to be human. Yet these are often some of the basic needs we mental health professionals can find lacking and forgotten among the demands of our workload. 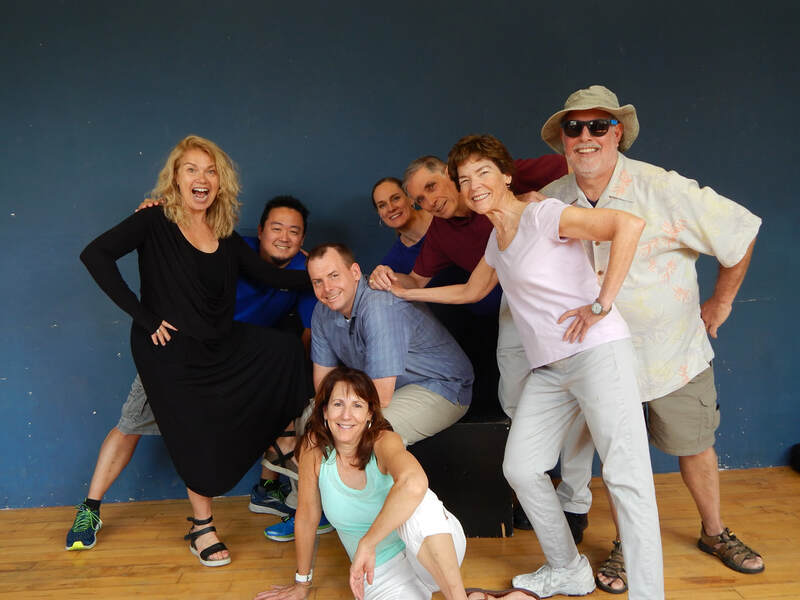 With our knowledge base of improvisation and years as clinicians, the members of the Therapy Players are committed to expanding the burgeoning potential of improvisation and using it along with tailored sketch comedy to bring laughter and insight to our work.